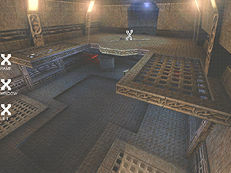 This is the latest installment from the mapper who brought us the excellent Rrajigar maps for DM and CTF, and I downloaded the map with high expectations. After playing several matches I am left with very mixed feelings. The lighting and texturing are near perfect as with all his maps. There is plenty of contrast and the light is fairly dark, but that only accentuates the attention to detail. On a technical level, the map is flawless, no HOM effect, and it runs very smoothly. Weapon placement is also fine, nothing fancy, but enough weapons to keep you happy. Where the map starts to fail is the floorplan; it's a small map, which has been carefully engineered to feel larger than it really is, and while it's an admirable feat, it makes the level somewhat confusing and removes any element of flow. One room has a reflective floor, and it took me a long time to figure out whether it was transparent, or mirrored! You may like it, I didn't. Bot support is also a mixed bag, the bots work well in some rooms, but I noticed them get caught a few times in the hallways, the only way they would move is if they were killed, the only way of getting a friendly teammate back into the action was to lure an enemy in to kill him/her, shooting them only resulted in a comment as the bot ran back to the same spot to get stuck again. Not much in the way of groundbreaking sound effects, in fact nothing in the map is groundbreaking. If you like the style of David's maps then download it and check it out, otherwise it's an above average map that looks a lot prettier than it plays. Looks ok, plays ok, is fun unitl it gets old= pretty much average. Well comon....are we playing maps to look around or do we play for competition? Saturday is one of the few maps (like SpireTemple or Golmud for example) you can use in competition. The special about Saturday is the damn high speed in a 5on5...so it gets a 9 from me.